Neil - I found Ranger Joe cereal and have added it to the gallery. Looks like they had both wheat and rice varieties. 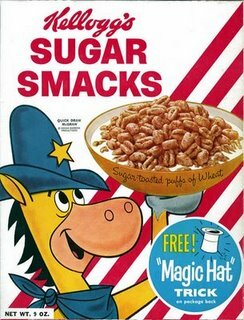 I believe the original sweetened puffed wheat was called Ranger Joe. I loved them as a kid. And, yes, they were sweet enough to put you in a coma. I really disliked the sugary milk left in the bowl after I'd finished all the cereal.